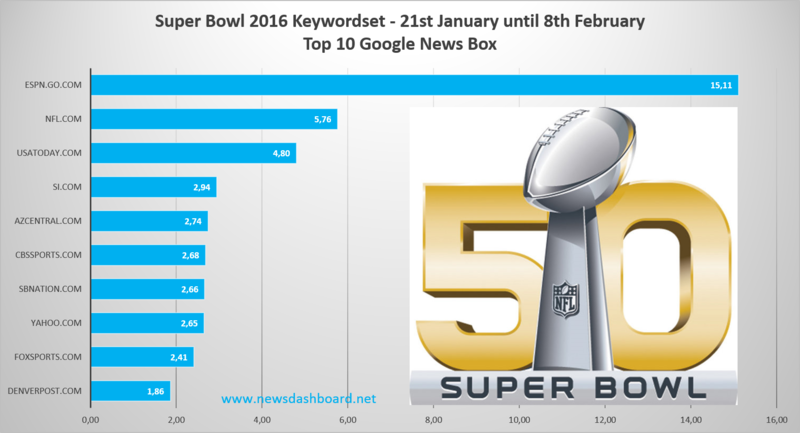 Super Bowl 2016 – Which News Publisher wins the Google News Ranking? Every year, the Super Bowl not only drags millions of people in front of their TVs – the demand for the event is also huge on the net. 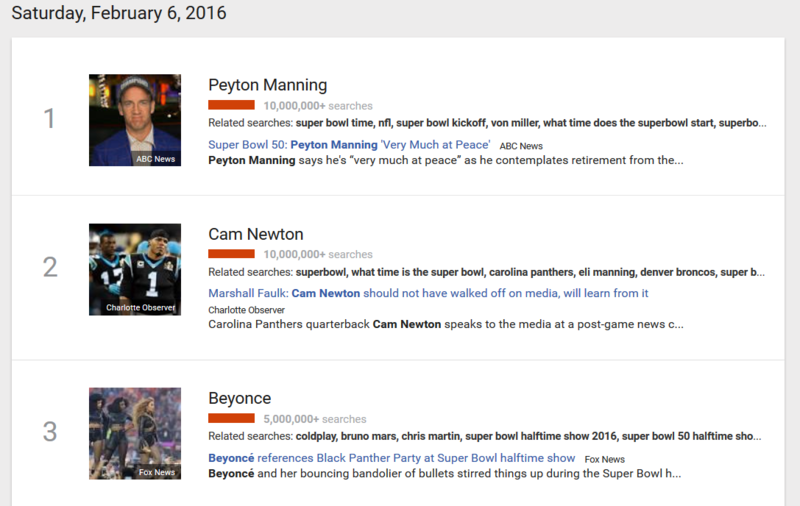 For the three keywords “Peyton Manning”, “Cam Newton” and “Beyonce” alone, there were more than 25 million search queries at Google USA on the day before the final (view Google Trends US’s screenshot). Many other keywords concerning the Super Bowl were also searched heavily. The volume of traffic allocated by Google for these topics was very high. On the day of the final itself as well as on the days before, the Americans were highly interested – the perfect time for News Publishers to acquire a lot of traffic through high Google News Ranking. We analysed, who ranked most frequently in the Google News Boxes in the USA. Therefore we drew up a set of keywords for the Super Bowl, amongst others with the keywords “Super Bowl”, “Super Bowl 50”, “Carolina Panthers”, “Denver Broncos”, “Cam Newton”, “Peyton Manning”, “Beyonce Super Bowl” and 25 other relevant keywords. We chose the period from 21st January until 8th February – so a few days before the Conference Championships until one day after the final. The keyword set contains all the names of the teams that were still in at the time, the quarterbacks, and general keywords around the Super Bowl and the music stars that were supposed to perform at half-time. Visibility in Google News Boxes in percent. Espn.go.com as the clear winner. The chart shows clearly, that when we consider all keywords we chose for the Super Bowl 2016, espn.go.com is by far the most successful in the Google News Boxes. 15.11 percent of all posts in the News Boxes belong to espn.go.com. Afterwards we have the official NFL page, which reached a number of 5.76 percent, followed by usatoday.com with 4.8 percent. It does not come as a surprise that many sports websites are between the top 10, like Sports Illustrated (si.com), cbssports.com, sbnation.com or foxsports.com. Even two regional News Players made it into the News Boxes relatively often: azcentral.com from Arizona and denverpost.com. The Denver Broncos won the Super Bowl, the Arizona Cardinals made it into the Conference Championships. Therefore, those two publishers were able to score in Google with their closeness to the teams. 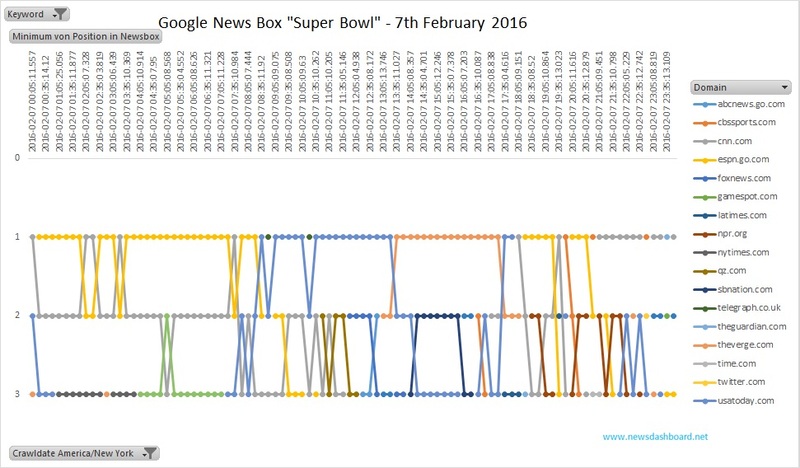 The following graph concerning the visibility in the Google News Boxes for the day of the game at 7th February 2016 shows a different picture. There is no clear winner for the keyword “Super Bowl”. On the upper part of the graph you can see the time. Line 1 shows the News Players that hold the first position in the News Box; positions 2 and 3 of the respective News Box for “Super Bowl” follow. espn.go, which appeared to be overpowering so far, is still in the News Boxes, but not as prominent and often as before. Espn.go.com is able to hold the 1st position between Midnight and 8 a.m. As of 8:30 a.m., the website slides down the 2nd place; one hour later, espgn.go.com is only on place 3. Afterwards, the sports website disappears from the News Box altogether. It is already 6:20 p.m. when it comes back. In the meantime, other News Players were able to prevail in the News Box for the keyword “Super Bowl”. From 8:30 a.m. until 1:30 p.m., usatoday.com won the desired first position in the News Box; afterwards, theverge.com prevailed until 5 p.m. There was quite a bit of movement for the general keyword “Super Bowl” in the News Box. In spite of the “lost” News Box for the keyword “Super Bowl”: espn.go.com is the overall and clear winner of the Google News Ranking around the Super Bowl if Google News Boxes to the relevant keywords are concerned. No other News Publisher was able to reach even remotely close high numbers. Even the official NFL website with topical information about players, teams and everything else important, was not able to overtake. The numbers of nfl.com and usatoday.com were as well relatively strong, at least when it comes to the other News Players in the top 10. Positions 4 to 10 were relatively close together.